The world being what it is today, there are many people who are finding that their Superannuation and a maybe small amount of savings to get by after retirement may mean a significant downgrade to quality of living, the need for careful budgeting, and sometimes a reliance family to help out financially. Costs of living are rising, and unexpected bills or health problems can put a real strain on the household finances. Many of us just don’t have the money to spare to cover costs like this, let alone to live the life we want to be living, and be able to offer our family financial support if they need it- instead of the other way around. It used to be that the way to secure your financial future was to work hard and save your money. Today, it has almost become a necessity to start planning ahead of time, and make smart investments now- that you will thank yourself for in the years to come. With property being one of the safer options as an investment strategy, why are more and more looking into a dual occupancy investment instead of a just building a standard home? Glad you asked! Read below to find out why a dual occupancy home could get you ahead of the game. Stamp duty is one of the less pleasant aspects of buying an investment property, but when you build you are only required to pay stamp duty on the price of the land only; not on the value of the building contract. Depending on the size of your property investment, this can mean saving many thousands of dollars in Stamp Duty. 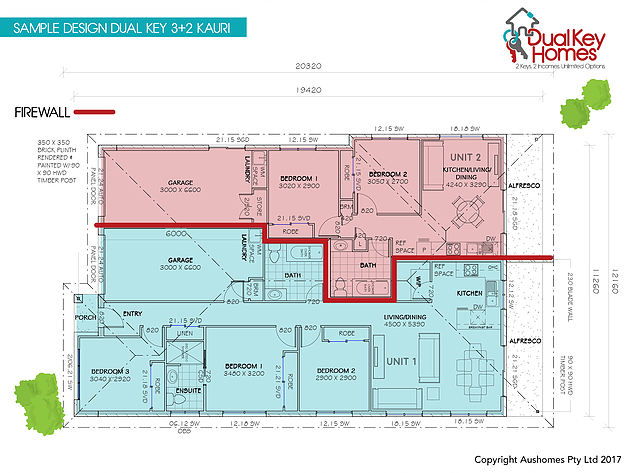 Many investors will consider building a duplex in order to have two rental incomes generated from their investment. This is certainly one great strategy for fast tracking your return on investment, however you are also stuck paying two sets of council rates. A dual occupancy home gives you two sets of keys, the residences are separated by a soundproof firewall, and you can legally rent out both residences… but you are only required to pay one set of council rates. How many families do you know that have older relatives who are looking to downsize, or need their care on an ongoing basis? How many people do you know that work from home and would benefit from a home office seperate to the house? How many young families can’t afford full time childcare, and rely on grandparents to care for their children during the day? One of the more creative strategies to maximise income is moving from your current home to a dual key home, where you reside in one unit, and a renter resides in the other. Your mortgage payments get a boost each week, and you will know firsthand that your investment is being properly cared for. Of course with two completely different sets of keys, and the soundproof firewall, you can live in complete privacy while enjoying your new home designed just the way you wanted. If at any time a double occupancy investment home isn’t working for you anymore, it’s as simple as adding an entryway between the two units and you have a larger single occupancy home. There are many factors which all contribute to a positive cashflow from a dual key investment property. Increase rental yield over the traditional home; with both residences rented out, we have two rental incomes generated. These two rental incomes will cover the mortgage loan repayments, plus give you extra cashflow, or you may opt to add it to your mortgage payment to pay it off quicker. With the dual key residences there are only one set of council rates but two incomes and two depreciations, and of course the potential for increased capital growth. One of the many benefits of a dual occupancy home is that the property is often valued at a significantly higher price than the cost of the build. This makes it possible for the equity in your first investment property to be used to secure finance for a subsequent property. Two properties with four rental incomes generated.